It is amazing when we hit an entire chapter, many times they are short, sweet and to the point. This chapter is no less a contender to be on point. Mrs. Lin knew it applied to her and we can too! Great, indeed, is the Holy One. There is GREAT Promise in these verses of Scripture, which apply to a sinner (unsaved), newly saved and many years a Saint (still imperfect). All the bases are covered in this truly sure, Song of Praise. To many a surprise, they have Him as their strength, but miss the full joy of having Him as their SONG! It can be troubling to see Him, when we know we are in trouble, possibly from an askew step, which becomes WAY off course. By this time, we have guilt set up as our factor of consideration, not realizing that IF we’d had Him as our Day-song, the misstep would not have been taken and there would be no mess to clean up and relationships to repair because of it. While the study for this Series is MUCH larger than is even began to be shown here, there are six verses to learn. Having a day that is “all over the map” so to speak? Who is your guide? Are you having to listen to something to drown out having to thinking about it? Or rather, are you exiling yourself from others so you cannot hear them? No matter where you find yourself, it is possible to sing. Is there a possibility that you don’t remember how? 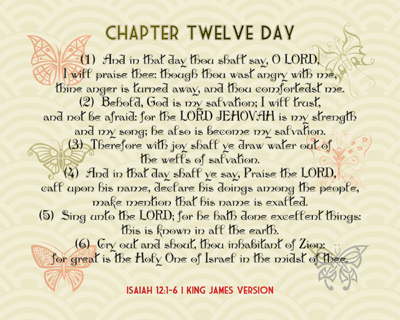 When you are having a tough day and the walk through it seems to be without end, consider having a “Chapter Twelve Day” – a smile just ripped across my face, because I’ve had a few of those days myself. It is possible to have this kind of day, every day – read the verses – it covers just about every kind of day we could have… Somewhere in between the start of verse 1 and the ending of verse 6 is someone’s day. This Series print will go up on my wall as I consider singing it to Him and sharing it with others! THANK YOU Mrs. Lin for sharing your heart so I could catch it too! At the outset, many may not understand the correlation or connection with the theme for this Series and the Moon Lillie (Datura wrightii) which is used as the photography images provided. The Moon Lillie is a rather odd large flowering bell plant in that the bells, or blooms, stick up instead of hanging down – plus they bloom in the middle of the night and retire each bloom by approximately noon the same day. One can actually watch the entire process of the bloom pushing itself out of the covering, extending in to a protruding cylinder and then start to open, all over about a 6 hour time period. That time period begins at about 9:00 PM in the evening and is fully bloomed somewhere between 1:00 AM and 3:30 AM for most we’ve observed. The flowering heads are absolutely beautiful, as pure a white as one can imagine and they give off a perfume quality odor that with dew is almost indescribable. To see them at their peek, one has to be a night owl or get up pretty early when the sun rises to see all of them on a plant standing up in an array of white. While the bloom looks good – about 12 hours, the smell is intoxicating, but after that it is putrid – a thing to keep in mind also, the blooms are toxic. SO, for the purpose of this Series, let’s just focus on the time the Moon Lillie blooms and remains beautiful. Many times we as Christians can “bloom” when no one else is looking and can even “blossom” right in front of others when they are completely unaware. We may wait for things to happen in God’s Time, which are VERY contrary to our expectation of them – but yet, we can with the Holy Spirit’s Help, see the Blessings bestowed upon us and others, even when it looks like it may not be possible. Possible, you many ask – yes, possible to wait patiently, while continuing to seek His Will and Guidance, we can Thank Him, Praise Him, and have our walk match His Walk. 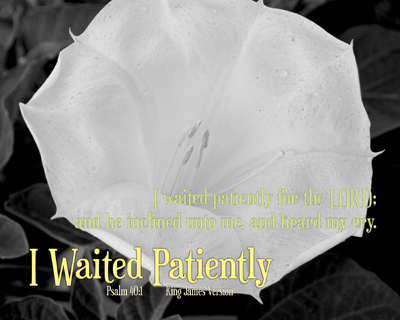 I’d caution against asking for Patience though, a situation could be put before you that would test the Patience of Job… The LORD does hear us as His Children – which Bloom a tad different than the world and we do NOT have to have a stadium of folks witness it for it to be real and/or realized in our lives. We of course want to Please Him and be a light in a dark place for others, but He also bids us to be in Contact with Him – sharing our challenges, difficulties and problems with Him, with full knowledge that He is Capable of Answering them, in His Time, simply. These verses should cause us to go back to Him and talk a while – while we wait for Him and Do as He Convicts us. This Series of ten (10) prints is based upon the theme of I Waited Patiently from Psalm 40, verses 1 through 17, as there were relevant to today. May each of take the time to realize that no all the growing we need to do takes place right out in front of other people. We may very well grow more in those places where there are not SO many others trying to sway us one way or the other as Christians. The time we spend with our Heavenly Father is a beautiful thing to Him, which is going to take some time to accomplish the time component of the process. We may very well Bloom when no one else is looking but our Saviour and our Heavenly Father – which should be the answer of every Believer. When is the last time you’ve grown a bit at the oddest hour in our life? Do you remember when not being able to go to bed had you in prayer for not only a situation in your life, but rather in someone else’s? Those are times when we can be equipped for Service in a manner we do not fully understand, but will recognize has happened. I can be a very impatient person myself, but I’ve seen His Hand in many situations where He has had me slow down – so I could talk to Him, which changed ME and how the situation of difficulty was being approached, handled and ultimately solved.